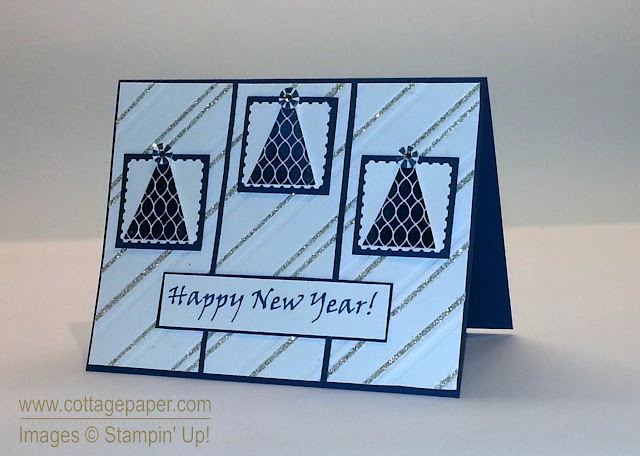 Cottage Paper: Happy New Year! I recently saw a card that used the Stylish Stripes embossing folder with random skinny strips of Silver Glimmer paper. I loved it! What a great idea for any card that calls for bling. I couldn't wait to use it on a card and the New Year seemed like a perfect occasion! When I thought of New Year and silver I also thought of Midnight Muse. Here is the card I made. I randomly adhered various thicknesses of skinny strips of Silver Glimmer paper into some of the grooves of the stripes. I found that varying thicknesses and random application of the strips made for a more visually pleasing element. (Which is a good thing since, for me, it is almost impossible to cut the strips exactly the same thickness!) While many embossing folders, like Wildflower Meadow, have a clear direction, others, like Chevron have no specific direction or like Square Lattice, have no direction at all. Also, while the look will vary, they generally can be used with either side up. You need to remember this when planning your cards. I had my card basically designed in my head but when I started to assemble the card I discovered a problem. I wanted to make a horizontal card with three party hats and assumed that the stripes would work fine with that design - but when I began to assemble the card with the side I wanted to use up, I noticed that the stripes flowed from the upper left to the lower right. I did not like that look, especially with the addition of the Sliver Glimmer paper. I wanted the stripes to flow from the lower left to the upper right. I am not clear if it really would make any difference but it did for me! I finally decided I could create the illusion I wanted by using two pieces of embossed Whisper White and cutting the pieces into three sections and splicing the pieces to make one horizontal piece. I used thin strips of Midnight Muse to visually create the three sections and cover my seam. I realized two things after the fact. One, to add a little more bling, I meant to use Shimmery White cardstock instead of Whisper White but got totally distracted by the stripe issue (darn! ); and two, I could have cut my finished embossed "piece" into three sections, shave a little off each piece where the sections would join and then mount them to an additional piece of Midnight Muse. That is an idea for next time! Even in MDS, Stampin' Up! has an extremely limited selection of New Year stamps and none fit with my design so I created an MDS text box that said "Happy New Year!" in a font I liked. I printed it in MidnighttMuse "ink" on Whisper White cardstock. I have some good news and some bad news for you. First, the good news is that tomorrow is the launch of the new Celebrate the Everyday Occasions catalog. I plan to post a PDF on the right side of my blog once it is available. The catalog contains lots of exciting new stamps, Framelits and accessories that I will be showing you over the next few months. Now the bad news. With the exception of the carryover items (see the carryover PDF on the right of this page), today is the last day to order from the Holiday catalog. This includes the Stylish Stripes embossing folder that I used here and which is not carried over. I really like that folder and find it to be very versatile. If you would like to have it you need to place an order today! Hope you have a wonderful New Year!! To order click on the ordering tab above just under the header or email me if you prefer. You can also email me with any of your papercrafting questions or ask them in a comment below! Really cute, Katie! Happy New Year to you and your family! Thanks Kelly! It is not a card I would want to make in quantity but once I had my idea I was too stubborn to change my plan. 😊 I like it also. Mailed it today to a nice family who extended great hospitality to us over the holidays.